We previously posted about Scraps during an ultimately successful Kickstarter attempt back in 2013. Skip forward almost two years, and the car construction and combat game is now available on Steam Early Access. There's a new trailer that gives you some idea of what it's all about. Through a selection of bolt-on parts, you get to build up your design and then take it out onto a server to battle against other user-created vehicles. 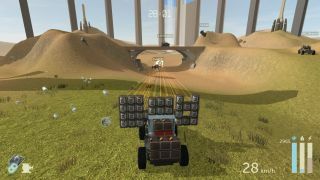 One of the game's main draws is the physics-based mayhem that can result from an ill-conceived construction. It looks, dare I say it, zany. And it seems to have had a pretty positive reception from the Steam userbase. For more, head over to Scraps' Steam page.